Each year, thousands of people make the decision to purchase their first home. What often is seen as a daunting, complex process, is one your Homebridge team excels in. You see, we help thousands of first-time homebuyers go through the process and obtain financing for the home of their dreams. We’re excited to start this journey with you and understand your path will be as unique as your needs. Let us guide you each step of the way. Our first step in this process is to help you understand what to expect as you begin your journey. While you don’t need to be an expert on this, it’s always nice to know what you’re getting into! What should I expect from the homebuying process? Transparency each and every step of the way. We want you to feel empowered to make the right decision on your home financing. That’s what Homebridge does. We ensure your process is seamless. 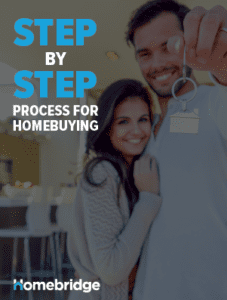 We created a guide to show you each step along your homebuying journey! Click the image below to download the guide today.